At stamp club we usually make three projects, and each project focuses on a certain product or technique. 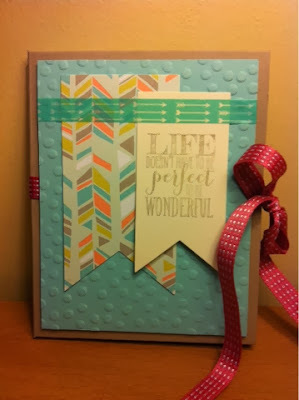 Once in a while I like to do a larger scrapbook project instead. The scrapbooking members like to get some ideas for their memory keeping, and the card makers like to try something new and go home with a photo ready scrapbook project. 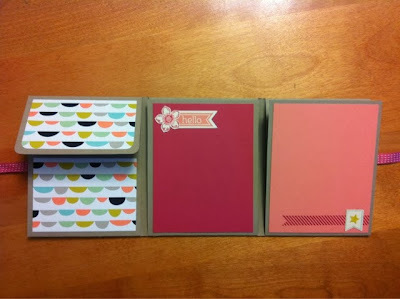 For our stamp club project I wanted to use the Sale-a-bration DSP, so that set the colour palette. I added Crumb Cake for the base, and Primrose Petals as an additional accent colour. For the cover we embossed a 3 1/2 x 4 1/2 piece of Pool Party card stock. (All panels are decorated with 3 1/2" x 4 1/2" layer) Then we cut out a piece of Sweet Sorbet DSP with the Banners Framelits Dies and an image from the coordinating Perfect Pennants Stamp Set with the same framelits. Those two banners are attached to the Pool Party base with Retro Fresh Designer Washi Tape. When you open the cover, you reveal a pocket on the left and a photo panel on the right. The pocket has some Sweet Sorbet DSP attached, and the corners have been rounded. The photo panel has a Summer Starfruit layer and two circles cut out with the Circle Framelits and glued only on the back and the edge near the fold so that a photo can be slipped underneath. The Pistachio Pudding circle is embellished with a flower from Banner Blast stamped in Primrose Petals. The Pool Party circle is stamped with an image from Perfect Pennants in Jet Black StazOn ink. When you open the Starfruit panel you reveal two photo/journaling panels. The Primrose Petals panel is embellished with an image from Petite Petals punched out with the coordinating Petite Petals Punch, and the hello from Perfect Pennants is stamped in Cantelope . The Crisp Cantelope panel is stamped with a diagonal striped banner image from Perfect Pennants in Primrose ink, the little banner and star are from Banner Blast and punched out with the Banner Punch, both free during Sale-a-bration! When you flip those two panels down, you reveal the last four photo/journaling panels. Three more designs from the Sweet Sorbet DSP are used here, along with a piece of Pistachio Pudding. The flap over the top middle panel has an image from Perfect Pennants stamped in Pool Party and cut out with the coordinating Banners Framelits, mounted on a Summer Starfruit banner and a slim strip of Primrose card stock. The flap over the right top panel was left plain, as I intend to mount a photo onto the flap, and a second photo underneath it on the DSP layer. The bottom left panel simply has a strip of Crumb Cake card stock embossed with the Decorative Dots embossing folder, also free during Sale-a-bration. The bottom right panel has been stamped all over with the small splatter image from Gorgeous Grunge in Pustachio Pudding ink. Three different images from Banner Blast were stamped in Starfruit, Cantelope and Primrose, and punched out with the coordinating Banner Punch, yes, both are free during Sale-a-bration. Whew! That was a lot of explanation for one project! The truth is, once the paper is cut it comes together pretty quickly, the club stampers completed their scrapbooks in an hour. All that's left is to print out some pictures! 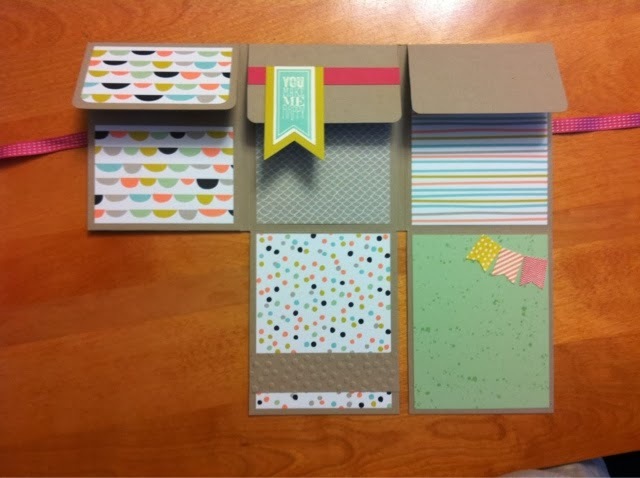 If you'd like to get in on Sale-a-bration and have some of these free products to use in your paper crafting, contact me and I will get you a copy of the brochure. Can't wait? 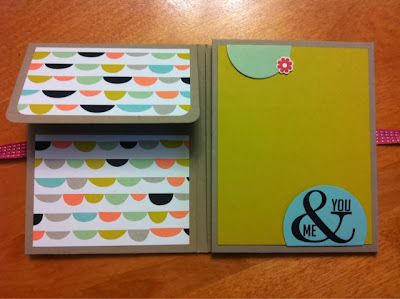 Go to my Stampin' Up! website to view it online.